Investors are conflicted about the financial services specialist's growth prospects. LendingClub (NYSE:LC) stock trailed the market last month, falling 11% compared to a 6% increase in the S&P 500, according to data provided by S&P Global Market Intelligence. The decrease added to significant losses for shareholders, as the stock lost ground in each of the lender's three years as a public company. 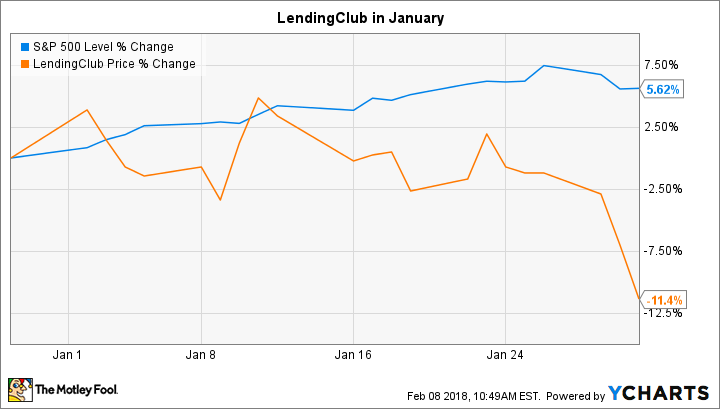 January's downtick reflects elevated investor uncertainty about LendingClub's profit prospects. After initially reacting harshly to news in early December that the company was lowering its growth outlook, Wall Street jumped back into the stock in hopes that the reduced forecast was more achievable -- and also reduced the risk of loan write-offs. Investors will find out soon how well the company is balancing the trade-off between growth on the one hand and taking on the right amount of debt risk on the other. Its outlook for the fourth quarter calls for revenue of between $158 million and $163 million, which should translate into a net loss of around $5 million when the company reports official results in the coming weeks. But unless it varies widely from those targets, LendingClub's fourth-quarter performance isn't likely to end the debate about the broader health of this business. That means investors can expect more stock price volatility ahead.